I’m going on holiday today, heading west. The journey will be made by train, at least until the last bit when a hire car will become necessary. I’m pleased with that arrangement, because motoring anywhere in London is no fun. But not so long ago, catering to the car was a big priority for the city. Writing about Hounslow in London’s Boroughs At 50, Tony Travers makes the point that the elevated section of the M4 motorway at Chiswick “has become an iconic part of the country’s motoring heritage”. He also tells us that it was opened in 1959 by film star Jayne Mansfield. He wasn’t making that up. 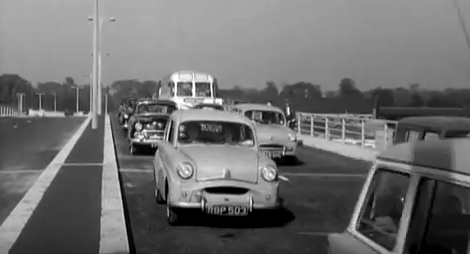 And these days you couldn’t make up the British Movietone commentary that accompanied the ribbon-cutting scene. Five years later, this happened. I’m off to Paddington station. See you soon.